New Line of Perfectly Gift-able Olive Oil and Vinegars by All Female Team The Perfect Provenance, a luxury lifestyle store & café, based in Greenwich, CT launches an exclusive line of vinegars and olive oils made in collaboration with The Secret Ingredient Girls - Chopped Champion, Silvia Baldini and olive oil sommelier Alina Lawrence. * Aged Rosé Balsamic Vinegar ($16.50 250mL) – Keep rosé all day going all year– Our Aged Rosé Balsamic Vinegar is made from the Pinot Nero grape variety, and has all the highlights of your favorite rosé wine. Bright acidity and soft, subtle aromas of strawberry, watermelon, and raspberry balance notes of minerals and slate. Excellent for salad dressings, marinades, glazes, pan sauces, soups, pickling, grilling or reduced to top cheese plates and fresh fruit, it pairs beautifully with extra virgin or flavored oils. Click link for more info. 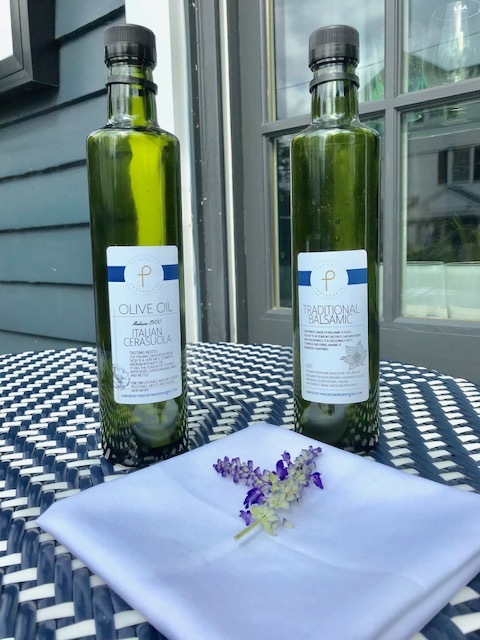 * Nocellara del Belice Extra Virgin Olive Oil ($19.50 250mL/$28.50 500mL) – The Perfect Provenance EVO comes straight from Sicily and epitomizes everything a mild all-purpose oil should be. Its sweet, floral aroma gives way to a slightly spicy taste that is packed with green apple, green grass, mint and black pepper. Fresh and lively, this one is sure to please for months to come. Click link for more info. * Herbs De Provence Olive Oil ($19.50 250mL) - a luscious olive oil that contains Savory, thyme and bay leaf, capturing the essence of the hillsides of Southern France; great for roasting chicken or poultry, create savory aioli, perfect for bread dipping, drizzle over roasted vegetables and grilled fish - $19.50 Click link for more info. * Traditional Balsamic Vinegar of Modena ($16.50 250mL/$23.50 500mL) - made from the finest grade of Balsamic, aged for up to 18 years in chestnut, oak, mulberry, cherry and ash barrels, the Traditional Balsamic Vinegar of Modena exceedingly rich, complex and dense, making it markedly adaptable; excellent for salad dressings, marinades, glazes, pan sauces, soups, pickling, grilling, over ice cream, cheese, and fresh fruit. Click link for more info. Silvia Baldini and Alina Lawrence have created The Secret Ingredient Girls to share their passions for food, cooking and wellness, with others. Silvia, originally from Turin, Italy, became the first professional female Chef in Connecticut to win Chopped, an award-winning show on Food Network. Alina is one of just a few women olive oil experts in the United States. She received her training and certification in sensory analysis from The National Organization of Olive Oil Tasters in Imperia, Italy. Her talent and passion, combined with years of training, have helped her becoming a highly sought-after olive oil consultant.